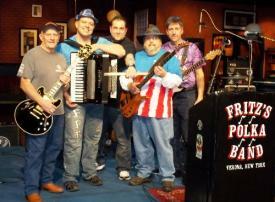 FRITZ'S POLKA BAND�TAPES FOUR TV SHOWS BEFORE A CAPACITY CROWD!!! Jagermeister-sponsored, Fritz's Polka Band (FPB) from Verona, NY, taped four TV shows on February 4, 2012 before a capacity crowd for the "Let's Polka" program aired on WSKG in Vestal, NY. This marked the first time FPB had recorded a full TV show since FPB founding member, Fred Scherz Sr. passed away back in 2009. FPB took a bus load of friends to this event and had an incredible time!!!! Below are 18 pictures from that special moment in FPB history. On the FPB bus trip home from taping four TV shows at WSKG on February 4th, Gabe looks on as Fritz (doing his best Gene Simmons imitation) has a Jager punch toast with his sisters Nancy (Gabe's wife) and Linda. Fritz's Polka Band is shown here after they wrapped up taping four TV shows at WSKG in Vestal, NY on February 4th. Fritz's Polka Band cranks out a tune during their fourth TV show taping of the day at WSKG on February 4, 2012. Fritz's Polka Band is shown here just prior to their fourth TV show taping of February 4th at WSKG in Vestal, NY. Tom, Frank, Mike, and Fritz are shown here during FPB's third of four TV show tapings at WSKG on February 4th. FPB is pictured here from behind the stage jamming on a tune during their second of four TV tapings on February 4, 2012. FPB tears through a tune during their first of four TV tapings at WSKG on February 4th. Fritz's Polka Band is pictured here shortly before the taping of the first of four TV shows for WSKG on February 4th in Vestal, NY. FPB fires up for soundcheck at WSKG on February 4th. Tom's guitar rig is ready to go at WSKG on February 4, 2012! Frank's guitar rig and Fritz's accordion rig (minus the accordion) are ready to go at WSKG! Gabe's guitar rig is ready to go at WSKG! Mike's drums are set up! Check out the new custom bass drum head. The FPB TV tapings at WSKG marked the first gig for this drum head! FPB bassist (and sometimes guitarist) Gabe Vaccaro makes some adjustments to his six string prior to soundcheck on February 4th at WSKG in Vestal, NY. The FPB TV taping at WSKG on February 4, 2012 was sold out! Here, some of the FPB fans are shown hanging out at the WSKG studio waiting for FPB's first taping to begin. FPB guitarists, Tom Campbell and Frank Nelson are shown here as the FPB stage set starts to take shape on February 4th. FPB drummer, Mike Faraino starts unpacking his drums at the WSKG studio in Vestal, NY on February 4, 2012. FPB guitarist, Tom Campbell is pictured here on the bus going to WSKG for the FPB TV tapings on February 4th.